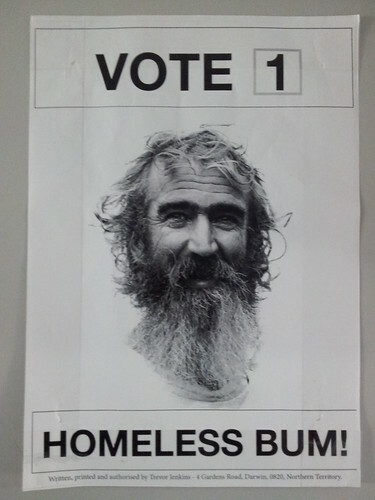 If you're voting in Darwin's local elections today, I urge you to vote 1 for Homeless Bum, Trevor Jenkins. Trevor is famous around Darwin, for his roadside artworks using rubbish and fallen tree branches, and his preaching for love and understanding. I introduced myself to Trevor while he was repairing one of his sculptures at the university. As we shook hands I immediately knew he was a good spirit. Eyes sparkling, happy, genuine, ready to engage. I asked him about his campaign to be Mayor of Darwin, and he passed me a copy of his poster. We then had a long conversation about a wide range of things social, and he easily won my vote, with the depth of his concern for people generally, especially the vulnerable - "which is eventually all of us at least once" he said. With his body odour, slightly mixed with the smell of the rubbish he handles, Trevor is a breath of fresh air to the political arena! He speaks of the need to connect people in Darwin, to bridge the very apparent gaps, in authentic and genuine ways, and to develop Darwin in creative and unique ways. He has no illusions on his prospects for winning the election, or of being accepted if he does, but the simple act of standing is enough. It gives him a platform and a reason to speak to people, and gave me my reason for approaching him. I was really moved by the things he said and the way he said it, and if Mayor is simply a ceremonial role of cutting ribbons and meeting the children, I can imagine no-one better than Trevor for the job. But if mayor is more than that, about writing policy and making systematic changes, again I can imagine no one better than Trevor. I don't know, and have not spoken to the other candidates, but it says enough to me that I have met and spoken at length with Trevor, while the others are just thousands of plastic political posters everywhere. I'm sure many of the other candidates are worthy, experienced, and have big ideas (and very bad ideas), but for me Trevor gets it, especially when you meet him in person. The ABC recorded a debate between 3 of the 4 candidates a couple of days. Interesting listening.